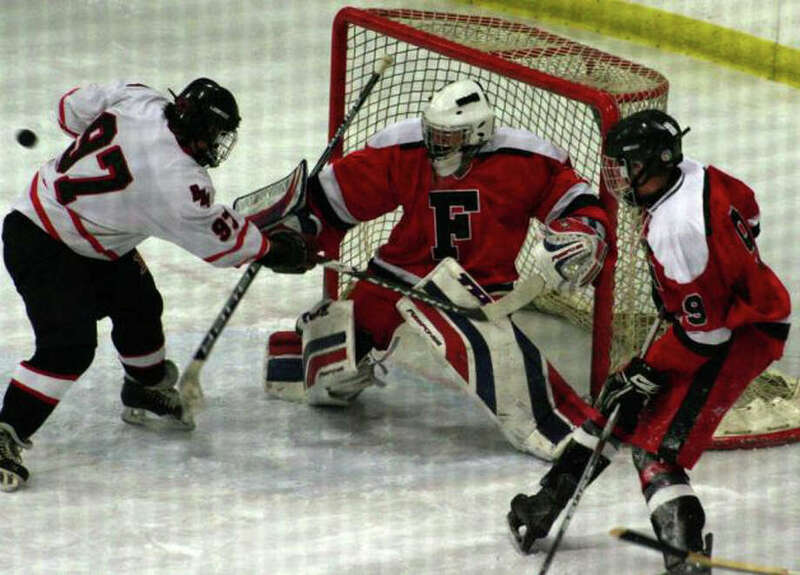 Fairfield goalie Connor Frawley, stopping a shot in action against Branford last year, will serve as the co-op hockey team's goalie again this year. Fairfield co-op hockey coach Mark Pettorini thinks his team is finally buying in. The third-year coach has a full crop of players who he has bred and groomed to play his style. This is the first season the Mustangs will have players who did not play for former-coach Adolph Brink. "The transaction from Adolph to me is over," Pettorini said. "That's nice." Coming off a season in which Fairfield finished 9-11, but suffered a disheartening loss in the first round of the Division II state tournament to Suffield-Granby-Windsor Locks in double overtime. "That was one of the toughest losses I've ever been a part of," Pettorini said. Fairfield enters its season this year under the perception that it is an underdog. With a group of strong Division I clubs at the FCIAC's peak-- including Darien, New Canaan and defending Division I runner-up St. Joseph-- getting eight wins and reaching the state playoffs is not easy. "Teams consider us a middle of the pack Division II team," Pettorini said. "But we prefer it to be that way, there's nothing more dangerous than an underdog." Pettorini-- in his eighth season overall with the Fairfield club-- also learned quite a bit as the club's assistant when it reached the Division II state tournament in 2008. "We learned what it takes to get to that level," Pettorini said. This year, Fairfield will be led by forwards and junior captains Mike Aquila and Paul Barlow. Aquila and Barlow will be two of the strong, deep forwards the Mustangs will put on the ice. "We don't have any all-star forwards," Pettorini said. "But we'll have three solid lines of good hockey players." In net will be second-year starter and junior Connor Frawley. Protecting the cage in front of him will be juniors Dan Silvestri and Kevin Robinson and sophomore Connor Scharlop. The club only has two seniors, so any strides Fairfield makes will be valuable for two years. But the team still has the same goals of reaching the state playoffs. "We've got to get those eight wins," he said. "We just want to get to the tournament and go from there."